The Movimiento Nacional de Víctimas de Crímenes de Estado – MOVICE (National Movement of Victims of State Crime) is an organized movement composed of more than 200 organizations of victims of enforced disappearance, extrajudicial executions, targeted killings and forced displacement which supports organizations and human rights defenders. It was created 12 years ago and has a territorial presence in 15 departments. The MOVICE was officially born on the 25th of June 2005 during the Second National Meeting of Victims of crimes against humanity, serious violations of human rights and genocide. More than 1000 delegates, 230 organizations and 400 regional representatives of 28 departments participated. However, the origin of this movement goes back to 1996 when various human rights organizations decided to create a Colombia Nunca Más (Never Again) movement. With this initiative the investigations began with the creation of methods for the analysis of information on State crime committed throughout the country. Asociación de Familiares de Detenidos Desaparecidos de Colombia –ASFADDES-, Colectivo de Abogados “José Alvear Restrepo”, Comisión Intercongregacional de Justicia y Paz, Fundación Comité de Solidaridad con los Presos Políticos –CSPP-, Comité Permanente por la Defensa de los Derechos Humanos –CPDH-, Comisión Interfranciscana de Justicia, Paz y Reverencia con la Creación, Corporación Sembrar, Comité Regional de Derechos Humanos de Santander –CREDHOS-, Fundación Reiniciar, Colectivo de Derechos Humanos Semillas de Libertad –CODEHSEL-, Corporación Jurídica Libertad, Comunidades Eclesiales de Base y Grupos Cristianos de Colombia –CEBS-, Humanidad Vigente Corporación Jurídica, Fundación Manuel Cepeda, Asociación Nacional de Usuarios Campesinos Unidad y Reconstrucción –ANUC UR-, Asociación Nacional de Ayuda Solidaria –ANDAS- y la Comunidad de los Misioneros Claretianos de Colombia. In May 2000, the Seminar on Impunity took place. 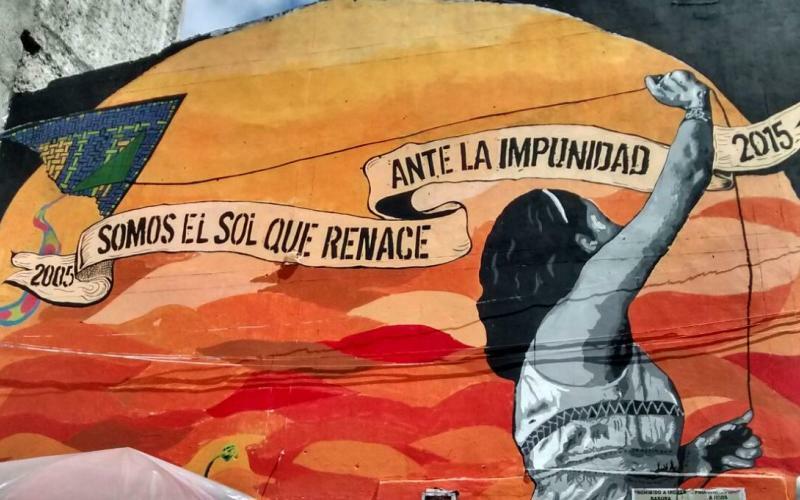 The same year, on the 25th, 26th and 27th of November the National Assembly of Victims took place and focused on the Project Nunca Más in Colombia which demands were that crimes against humanity needed to be regarded as State crime. These meetings focused on the idea that it was necessary to make progress on the themes of truth, justice and the integral reparation of State Crime victims in Colombia while taking into account processes that had been done in other parts of the world which have suffered similar traumas. The First National Meeting of Victims of crimes against humanity and human rights violations took place on the 28th and 29th May 2004. More than 1000 delegates, 230 organizations, 400 regional representatives of 28 departments participated. There was international support from delegates from 7 countries. On June 27th 2005, during the Second National Meeting of Victims of crimes against humanity, serious human rights violations and genocide, the MOVICE was created. More than 800 delegates were present and there were also regional meetings in cities like Cartagena, Medellín, Cali, Popayán, Barrancabermeja, Bucaramanga and Bogotá. Organizations of survivors of the crimes hereby mentioned, victims’ relatives, social, political or legal organizations that have been persecuted and that combat impunity while seeking truth, justice and full compensation. Organizations that support and help victims. Transforming our country through the combat against impunity in relation to crimes and human rights violations committed by the State via military and paramilitary agents and in relation to other forms of State terrorism. The recognition that the only way to end the internal conflict is through dialogue. Solidarity with all forms of mobilization that strive to obtain a life with dignity for our people. Fighting for victims’ rights to historical truth, justice and integral reparation. Demanding the recognition of victims as political subjects and securing guarantees of non-repetition. To be able to achieve this aim a real democracy is necessary, in which the rights of political opposition, of association and of dissent are guaranteed. The understanding of strategies, mechanisms, methods and techniques developed by the State that enable the perpetuation of political impunity. The dismantling of all war structures, the demilitarization of civil life and as soon as possible the signature of humanitarian agreements that reduce the impact of the armed conflict on the population. Legal strategy to pursue a maximum of perpetrators of crimes and establish State agents’ responsibility. Strategy for truth and historical memory. Strategy to obtain support for the victims: the Ethics Commission. Strategy for non-repetition: legal prohibition of paramilitarism. Strategy for reparation: alternative land registry. Strategy against enforced disappearance: the exhumation of mass graves and the right to bury. Strategy against political genocide: truth, justice and compensation for victims and survivors of the Unión Patriótica (Patriotic Union). Strategy of organization : reinforcement of the Victims’ Movement. In 2007, human rights platforms and peace initiatives, including MOVICE, were convocated by the National Government for the creation of a Human Rights Action Plan which was suspended due to a lack of guarantees from the government at the time. In parallel, the March of the 6th of March 2008 “Victims’ fight is the entire society’s fight” was the message that enabled an unprecedented visibility of the State Crime victims in Colombia. This event caught the attention of the national and international community including mass media that broadcasted it in the majority of TV and radio channels as well as in newspapers. The MOVICE succeeded in obtaining the support of the Colombian society but this has not created a change in State policies on this matter. On the other hand, there is the systematic covering up of State Crimes committed by State agents and paramilitary structures. In 2009, the scandal of extrajudicial executions of some young people from Soacha who had been presented in other regions of the country as soldiers who died on the field under “dirty war” dynamics came to light and the term “False Positives” appeared. After that, the 5th and 6th of March 2009 the “National Day of Denial of Extrajudicial Executions: false positives are State Crimes” took place and from that event a public declaration demanding justiciability of their rights and the public sentencing of crimes was published. The State Crime Victims identify that the only real guarantees in the fight against impunity are the ability to organize, the strategies of action and assertion of the victims’ rights, the presence and solidarity of the international community and also the exhaustive documentation produced by the Nunca Más Project in Colombia over the years. We are seeds, we are memory and we are the sun rising against impunity.